Do exit-optins really work? Getting double or even triple digit growth by just implementing a simple trick feels a bit too good to be true. Well, it is true. We have shared several case studies showing companies getting triple digit growth in subscribers by only using exit-intent popups. Today, we’re going to highlight another customer of OptinMonster who increased his conversions by 316% with exit-optins. 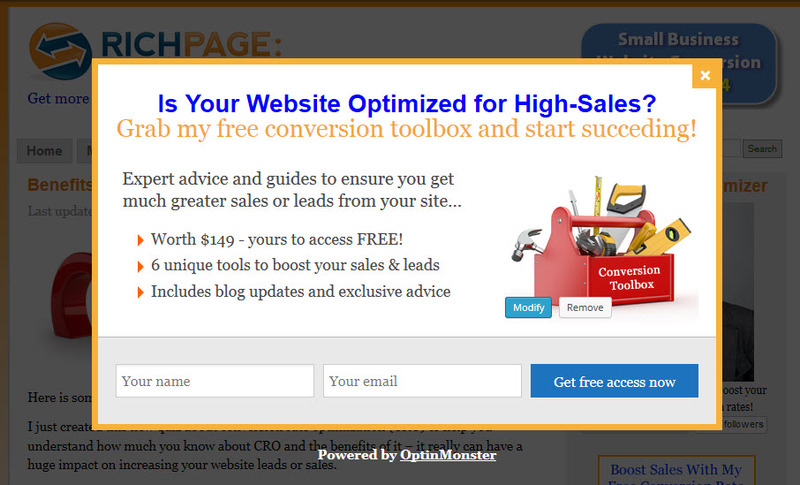 Rich Page is a conversion optimization expert who offers CRO services on his site. He helps businesses get more website leads and sales by optimizing their existing traffic. As Rich prepared to launch a new product, The Website Toolbox, he knew he needed additional opportunities for his viewers to subscribe. He also knew that exit-intent popups were the best tool for the job. After trying several different popup solutions, he chose OptinMonster. Rich was particularly interested in OptinMonster because of our conversion-ready designs as well as our page level targeting features. He knew his conversions would increase when using an exit-intent optin, so he was eager to implement it. For those of you who are new to exit-intent technology, it tracks the user’s mouse behavior and only show the popup at the precise moment they are about to leave. These optins are less-intrusive than other optin types because they politely intercept the visitor with an offer before they leave. Before using OptinMonster, the site-wide conversion rate for The Website Toolbox was 1.4%. Rich added an exit-intent optin using our Clean Slate lightbox theme. He then began split testing the headline, benefits and call-to-action. Rich increased his overall conversions to 4.56% – a fantastic 225% increase! Just what he had hoped for! After seeing such success with the first optin, Rich added the same optin to his Website Toolbox registration page. Using the same optimized exit-intent popup, he did EVEN BETTER, increasing the signup rate from 12% to an amazing 50%! All of this without getting any additional traffic. That’s the power of exit-intent. As a conversion rate optimizer himself, Rich found OptinMonster’s split testing feature essential. Creating a split-test is as simple as clicking a button which replicates an existing optin, then making changes to your new optin. Our conversion analytics track impressions, conversions, and the landing page where the conversion happens. These numbers will clearly indicate which option has the highest conversion for you. Rich recommends testing different types of headlines when split-testing. Headlines asking questions that speak to a visitor’s pain points can work very well, or ones that mention a strong benefit. You can even split test different types of incentives to see which has the best opt-in conversion rate. Then, be sure to continue to test the wording and imagery of the winning version. 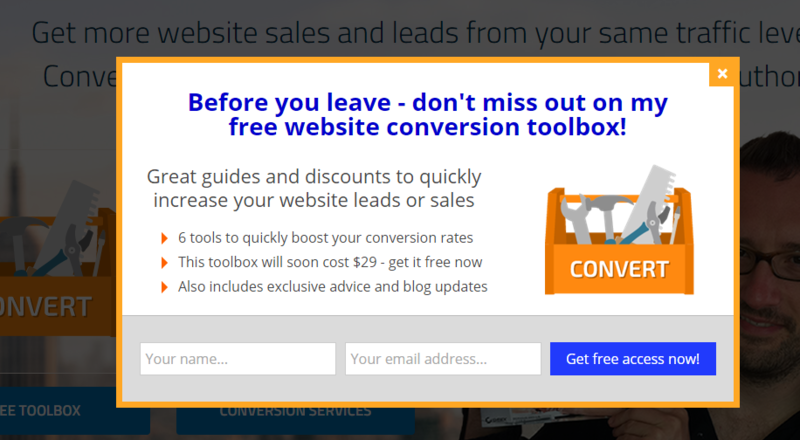 Here are 8 A/B Tests to Run on Your popups. Rich Page increased conversions by testing headlines, body copy and calls-to-action in his exit-intent optins. Rich Page increased his overall conversions by 225% by using exit-intent optins. Rich Page further increased conversions to 316% split-testing those optins. If an expert conversion rate specialist can benefit from OptinMonster’s split-testing and exit-intent optins, don’t you think you could, too? This was a 316% increase in conversion rate that I was very happy about – I had over quadrupled the amount of subscribers I was getting each day!